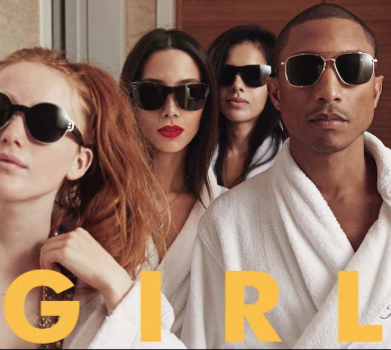 While my anticipation for Pharrell's 'Girl' album was immeasurably high, I have to confess that in complete honesty... the end result didn't really move me as I hoped it would. I'm a humungous Pharrell and Chad fan (as other posts here prove) so ultimately, I'm thrilled for the huge resurgence in his star and popularity - it's also compounded with the amazing work he's actually done for other artists too so my current musical fantasy is for a Pharrell album with his vocals on the songs he produced for others. Originally performed by Robin Thicke featuring TI. I imagine little needs to be said about this number - this is what made Pharrell an in-demand producer again and although he does include this song amongst his current live set-list, a studio version would be amazing. Originally performed by Daft Punk featuring Pharrell on lead vocals with Nile Rodgers on guitar. The song served as one of two vocal contributions Pharrell made to Daft Punk's 'Random Access Memories' album and catapulted Pharrell back into front-man limelight. Originally performed by Cee Lo for a song that appears on the 'Dispicable Me 2' soundtrack. Recent reports state that Cee Lo's camp turned down 'Happy' so I imagine they did so for this song instead. Originally performed by Mayer Hawthorne for his album 'Where Does This Door Go'. I actually named this one as my song of the year last year - it serves as one of four songs Pharrell contributed to Mayer Hawthorne's album. Also originally performed by Mayer Hawthorne for his album 'Where Does This Door Go'. Originally performed by Aloe Blacc for his album 'Lift Your Spirit'. Originally performed by Paloma Faith for her album 'A Perfect Contradiction'. Definitely an unlikely union, but that's what's great about Pharrell. The funky guitar sounds like a James Brown riff and could have made a great addition to 'Girl 2.0' (I may need to copyright this title quick-smart!). Originally performed by Mary J Blige, featuring Pharrell, for the 'Think Like A Man Too' soundtrack. Originally performed by Robin Thicke for the 'Dispicable Me' soundtrack.